To the Urban League of Hudson County for its new headquarters helping to revitalize an important neighborhood in Jersey City. The Urban League of Hudson County refers to its new, state-of-the-art headquarters as “Project Reclaim” because it is much more than a building; it represents the social and economic rebirth of the once-thriving Martin Luther King Drive neighborhood in Jersey City. Martin Luther King Drive, formerly known as Jackson Avenue, was once the foremost shopping area in the southern half of the Jersey City. Over time, as new development patterns pulled jobs and investments into the suburbs, the district and adjacent residential areas began to deteriorate, stores began to close and buildings eroded. Even as the “Gold Coast” or Hudson River Waterfront saw new investment along with rising property values and employment in the mid-90s, the 26-block district along MLK Drive continued to lag behind. Despite several efforts on the part of the city to redevelop the area, by 1988 it was clear that a more comprehensive plan for the MLK area was necessary. After several attempts at creating a plan for the neighborhood, the city found success with a community-based planning strategy that was structured to work with residents from the outset. In 1993, the Martin Luther King Drive Redevelopment Plan was officially adopted. At the core of the plan was the creation of a hub, or village center, to include 100,000-square-foot shopping center, restaurants, a Village Green, a new US Post Office, and a new station for the Hudson-Bergen Light Rail transit system. 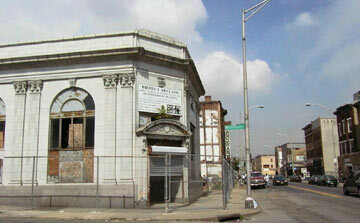 During this period of intense community planning, the Urban League of Hudson County was searching for a new home. A nonprofit social service agency with a mission to provide equal access to its community-based programs, the Urban League realized that its location in the McGinley Square portion of town was not convenient to its primary clients, who predominantly came from the MLK area. Bolstered by the potential of the newly adopted redevelopment plan and committed toward making a difference in the disenfranchised MLK community, the agency leadership finally found what it was looking for in the old First Fidelity bank building at 253 MLK Drive, the last bank to leave the commercial corridor. The Urban League soon outgrew the space, both physically and technologically, and between 1994 and 1996 it assessed the building’s potential for expansion. Working with the city, the Urban League and its nonprofit real estate development arm, the Affordable Housing and Community Development Corporation, were able to assemble the neighboring properties and made the important decision to remodel and expand. It was important to the Urban League that the building be first-class; a symbol to the community, and to investors, about what was possible in the neighborhood. The adaptive reuse of this turn-of-the-century bank building quickly became a complex architectural project involving rehabilitation, preservation and building an addition. The Jersey City-based architectural firm Gami and Associates was hired to take on the challenge of designing a new headquarters that respected the scale and quality of the original structure while allowing for the integration of new architectural features and a more modern style. The architect had to harmonize a new structure with an old one, without directly imitating the materials or form of the more formal original structure. The challenges to this project did not stop at the design phase. Perhaps the biggest hurdle was to secure the necessary $4 million in funding needed to see the project to completion. Early on, the Urban League secured bond financing with the New Jersey Economic Development Authority as well as Community Development Block Grant funds from the city, but still needed to find a bank with an AAA rating that was willing to come forth with a letter of credit. Given the long-term disinvestment in the MLK area, the Urban League pitched the project to banks by selling the stability of the agency and its history throughout the state as well as the Affordable Housing and Community Development Corporation’s expertise in real estate development. There were a lot of skeptics, but First Union (now Wachovia Bank) was able to see the potential of both the location and the organization and agreed to the deal. Once in the construction phase of the project, the Urban League was hit with a blow when its contractor left the job. The complicated financing behind the project left no room for delay. The Urban League quickly approached The Enterprise Foundation (TEF), which specializes in loans, grants and technical assistance to nonprofit organizations that are building and revitalizing local neighborhoods. TEF helped the Urban League devise a way to avoid legal entanglement and keep the project moving forward as planned. The Urban League faced a surprising number of physical challenges to its project. The first was power. The headquarters was designed to be a modern, technologically sophisticated structure and it soon became apparent that the redevelopment area lacked the necessary power infrastructure to operate the building. The Urban League and the Affordable Housing and Community Development Corporation, with the city’s involvement, negotiated with PSE&G in order to add a transformer in the area to accommodate this and future projects. In addition, the communications infrastructure in the area was also inadequate, so the project coordinators worked with Verizon to install the necessary fiber-optic wires to allow for high-speed Internet and video-conferencing. No matter what the difficulty, at no point did the Urban League of Hudson County move away from the vision for its headquarters and its neighborhood. With the support of its partners – the Affordable Housing and Community Development Corporation, the City of Jersey City, The Enterprise Foundation, and First Union/Wachovia Bank Community Development Finance Group, to name a few – the agency was able to finish Project Reclaim and open its doors in Spring 2002. In addition to providing for its own headquarters, the Urban League created additional space for tenants, including the Affordable Housing and Community Development Corporation and the New Jersey Department of Correction’s program for children with incarcerated parents. Donald Payne, Congressman for the 13th District, plans to open a new office in the building as well. The headquarters hosts myriad social services, including a training facility for asbestos removal, childcare services, a green house for horticultural studies, and a computer lab to teach technology skills to members of the community and provide access to computers to those without it. The Urban League building also provides the only 24-hour ATM in the area. Provident Bank – the only bank that never left the MLK neighborhood – operates the new machine. Soon to open is an outdoor courtyard and garden. With redevelopment projects planned for across the street and throughout the Martin Luther King Drive neighborhood, the seeds sown by this effort are only just beginning to take root.